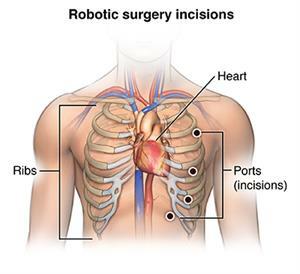 Robotic cardiac surgery is heart surgery done through very small cuts in the chest. With the use of tiny instruments and robot-controlled tools, surgeons are able to do heart surgery in a way that is much less invasive than open-heart surgery. The procedure is sometimes called da Vinci surgery because that is the name of the manufacturer of the robot often used for this procedure. Robotic surgeries have been used for a number of different heart-related procedures, including valve surgery, coronary artery bypass, cardiac tissue ablation, heart defect repair, and tumor removal. Why might I need robotic cardiac surgery? 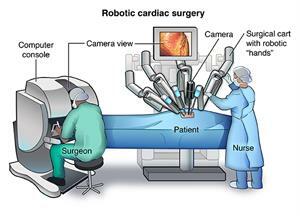 The main benefit of robotic cardiac surgery is that it is minimally invasive compared with open-heart surgery. Smaller incisions mean that you can heal faster and return to activities more quickly. Your healthcare provider may have other reasons to recommend robotic cardiac surgery. What are the risks of robotic cardiac surgery? One of the main benefits of robotic cardiac surgery is that it has fewer risks than open-heart surgery. The surgeon does not have to cut through the breastbone to open your chest. This removes many of the complications of open-heart surgery. In some cases, your doctor may not be able to complete the surgery with the robot. In this case, you would need open-heart surgery. You may have other risks, based on your specific medical condition. Be sure to talk with your healthcare provider about any concerns you have before your procedure. How do I get ready for robotic cardiac surgery? To see if you are a good candidate for this procedure, your healthcare provider will review your medical history, and lifestyle, as well as the overall severity of the disease. You will be asked to sign a consent form that gives permission to do the procedure. Read the form carefully and ask questions if something is unclear. Along with a complete medical history, your healthcare provider(s) may do a physical exam to ensure you are in otherwise good health before you undergo the procedure. You may also have blood tests and other diagnostic tests. Your healthcare provider(s) may recommend taking an aspirin before the procedure. If you are pregnant or think you may be, tell your healthcare provider(s). Tell your healthcare provider(s) if you are sensitive to or are allergic to any medicines, latex, iodine, tape, contrast dyes, and anesthetic agents (local or general). Tell your healthcare provider(s) of all medicines (prescribed and over-the-counter) and herbal supplements that you are taking. Tell your healthcare provider(s) if you have a history of bleeding disorders or if you are taking any anticoagulant (blood-thinning) medicines, aspirin, or other medicines that affect blood clotting. You may need to stop these medicines before the procedure. Tell your healthcare provider(s) if you have a pacemaker or other implanted heart device. If you smoke, stop smoking as soon as possible before the procedure. This will improve your chances for a successful recovery from surgery and your overall health status. Based on your medical condition, your healthcare provider(s) may request other specific preparation. What happens during robotic cardiac surgery? You may receive a sedative before the procedure to help you relax. You will be placed under general anesthesia for the procedure and you will have a breathing tube. A surgeon will make a series of keyhole-sized incisions on the side of your chest. These incisions will align with the openings between your ribs. You may need to be placed on the heart-lung machine for the procedure. Depending on the procedure being done, your surgeon will insert several precision-guided robotic arms into these incisions. These robotic arms hold and manipulate tiny instruments to do the required tasks on the heart or surrounding arteries. A tiny video camera will be inserted into another incision to provide a magnified, three-dimensional image of the operating site. The surgeon will control the robotic arms and camera from a console located within the operating room. Once complete, the surgeon will remove the instruments and close the incisions. Talk with your healthcare provider about what you will experience during your procedure. What happens after robotic cardiac surgery? Once the surgery is done, you will be moved to the recovery area to be monitored. You can expect a relatively short hospital stay to follow, usually half as long as that after conventional open-heart surgery. Your healthcare provider will typically discharge you once your pain is under control, you can keep liquids down without nausea and vomiting, and your lab tests appear near normal or near your baseline before the procedure. You can also expect less scarring on your chest. Open-heart surgery may leave a 10-inch scar on your chest. Robotic cardiac surgery just leaves a few smaller scars on the side of your chest. After being discharged from the hospital, most people can manage their pain with over-the-counter pain relievers like acetaminophen or ibuprofen. Pain also tends to go away much faster than with open-heart procedures. Keep your incisions clean and dry. Do not use powders, lotions, or ointments on the incision lines as this can irritate the skin and cause prolonged healing and increase the risk for infection. Do not soak the incisions in water until your doctor says it's OK.
Make plans to have someone give you a ride home from the hospital. 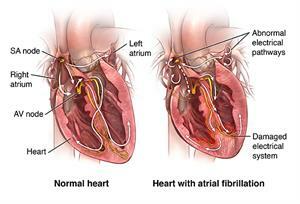 You may also return to normal activities more quickly than you would after open-heart surgery. Most people can resume their normal activities after a few weeks. Your healthcare provider will provide specific recommendations for activity. Your healthcare provider will typically schedule follow-up appointments to check your progress. Be sure to tell your healthcare provider right away if any symptoms occur after the procedure, such as chest pain or discomfort. 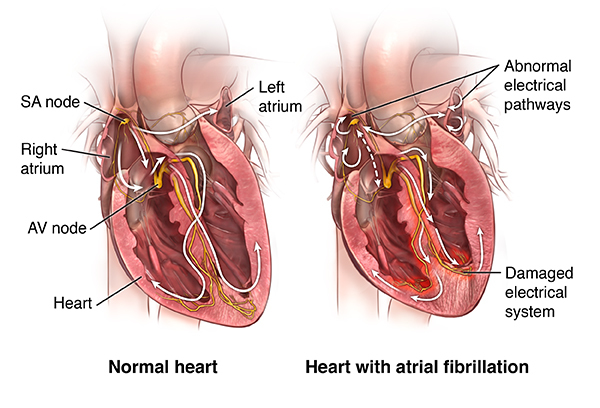 Complications are rare after robotic heart surgery, but possible, so it is important to carefully monitor for any symptoms and report them to your healthcare provider. Remember to take all or your medicines as prescribed.